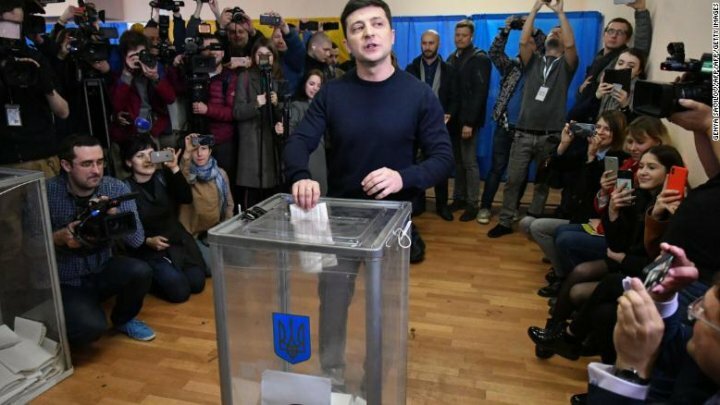 foto: Ukrainian comedian and presidential candidate Volodymyr Zelensky casts his ballot on Sunday. A comedian with no political experience has won the most votes in the first round of Ukraine's presidential elections, early results indicate, writes BBC. With half the ballots counted, Volodymyr Zelenskiy - who plays the president on TV - got about 30%, with current leader Petro Poroshenko on 16%. "I'm very happy but this is not the final action," Mr Zelenskiy told the BBC's Jonah Fisher, minutes after exit polls were announced. Mr Poroshenko described his second-place showing as a "harsh lesson". A total of 39 candidates were on the ballot paper. With none receiving more than 50%, the top two will go forward to the run-off on 21 April. The Ukrainian president has significant powers over security, defence and foreign policy, in a system described as semi-presidential. He has torn up the rulebook for election campaigning, staging no rallies and giving few interviews. He appears to have no strong political views apart from a wish to be new and different. Mr Zelenskiy's readiness to speak both Russian and Ukrainian, at a time when language rights are a hugely sensitive topic, gained him support in Ukraine's largely Russian-speaking east. His Achilles heel, however, is his relationship with Ukraine's most controversial oligarch, Igor Kolomoisky, says our Kiev correspondent. Mr Kolomoisky is the owner of TV channel 1+1 - which has given fulsome support to Me Zelenskiy. The oligarch, who lives in self-imposed exile, faces numerous investigations in Ukraine into his business dealings. But Mr Zelenskiy has insisted he is "no puppet" of Mr Kolomoisky. Mr Poroshenko, a chocolate magnate and one of Ukraine's wealthiest people, was elected in a snap vote after former pro-Russian President Viktor Yanukovych was toppled in the February 2014 Maidan Revolution, which was followed by Russia's annexation of Crimea and a Russian-backed insurgency in the east. The EU says that about 12% of Ukraine's 44 million people are disenfranchised, largely those who live in Russia and in Crimea, which Russia annexed in March 2014. Mr Poroshenko aimed to appeal to conservative Ukrainians through his slogan "Army, Language, Faith". However his campaign has been dogged by corruption allegations, including a scandal over defence procurement which erupted last month. Yulia Tymoshenko served as prime minister and ran for president in 2010 and 2014. She played a leading role in the 2004 Orange Revolution, Ukraine's first big push to ally itself with the EU.